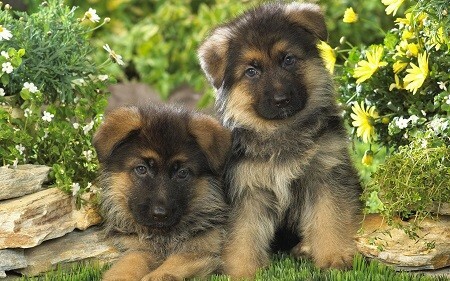 German Shepherds are clean animals, unless they dig up the ground and get dirt all over them. A GS puppy will not need frequent baths as it may be harmful for the delicate little pup. If your pup has had a bath from the shop you bought it from, there is no need to bathe it again, unless of course it gets dirty or catches some poo on its fur. It is always good to bathe a GS pup only once every month or two months. 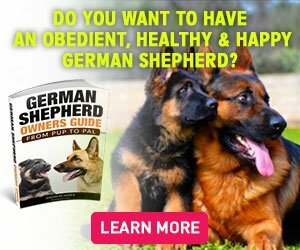 Is it Safe to Bathe a German Shepherd Puppy? Little GS pups are sensitive to weather changes and can fall ill if given baths. Young puppies need to maintain their body temperature which is inclined towards the warmer side. Whether you bathe your pup with warm water or cold, it will have a bad impact on its health, and it might catch pneumonia or other illnesses. That’s why many experts recommend that you don’t bathe your GS pup until it is grown or bathe it once every two months. If you bathe a GS pup, make sure you use a piece of cloth or towel to absorb the water from its fur. Keeping your pup dry will protect it from catching a cold. If you feel the need to give your puppy a shower but are afraid to do so, adopt other ways to keep it clean. Use a damp cloth to wipe off the dirt on your pup’s fur. Use a water spray to sprinkle few drops of water on your pup and use a cloth to clean it. Brush your pup’s hair every day to make its fur look fuller and fluffier. Use a soft sponge to clean your GS pup. 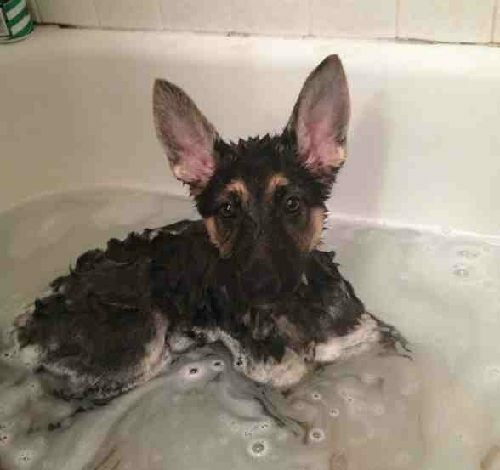 Bathing is part of grooming a German Shepherd puppy. If you want your puppy to stay clean and soft, you will need to bathe it once in a blue moon. GS pups will not need frequent baths, so keep the baths to a minimum. If your puppy gets dirty, you can use convenient and simple ways to clean it up instead of showering it. If you have no experience in bathing a GS pup, follow the steps given below and maintain your pup’s hygiene. Before you wet your puppy, set the temperature of the water to warm. Do not put your puppy under a full-force shower. Use a hose or a shower attachment to softly wet your GS pup. If it is the first time that you are bathing your pup, make sure you wet it a little at first and see its reaction. Do not pour the water directly on your pup’s nose as it will make your pup uneasy and scared. Start pouring water from the back of your pup’s neck and gradually move towards its back and tail. Use your hand to wet the lower parts of its fur. Make use of your hands to make your pup feel comfortable. Hold the hose or the shower close to your puppy’s fur/coat. Use a gentle shampoo and pour it on your puppy’s coat. Use a sponge or a soft cloth to make lather on its fur. Move the sponge slowly and gently on your pup’s fur and clean it from the top of its head to the tail and under its neck and lower body. Make sure that your reach every part of the coat. Do not get the shampoo in your dog’s eyes, ears, and nose, unless it is a gentle shampoo. It is better to keep the lather and shampoo off its face. Once you have thoroughly cleaned the coat with a sponge, rinse off the shampoo and lather with the hose. Shower the dog two – three times using the hose. Check your pup’s entire body and rinse the soap from under the neck and arms. Do not let any soap get trapped in your pup’s fur as it will be harmful for it. Use your hand to rub off the excess soap from your pup’s fur. Once your puppy is properly rinsed with water, let it shake off excess water. Take a dry towel to dry your pup’s fur. Lastly, use a soft brush and back brush your pup’s fur (back brushing means brushing in the direction opposite to your pup’s hair growth). If you feel the need of drying your puppy’s fur furthermore, use a dry towel again. Take your puppy in a warm room and make sure you do not open the AC with a damp pup in your room. Not every product in the market is suitable for your little pup. When choosing bathing products for your puppy, especially soaps, and shampoos, make sure you take suggestions from your vet. If your pup has a skin condition, do not buy harsh products that will irritate and burn your pup’s skin. Moreover, there are several products on the market that advertise their products as shampoos that make your dog’s hair fluffier. Do not fall for such advertising gimmicks and use products that are less abrasive and gentle in nature. Too many chemicals can harm a GS pup’s skin, causing its hair to fall and skin to dry off. A GS’s pH level is different than that of humans; that’s why human shampoos don’t work well on GSDs. Bathing a GS pup too much will kill its skin’s natural oils. If your dog has dry skin, use a moisturizing shampoo. If your dog has itchy skin, use oatmeal based bathing products. If your dog has oily or scaly skin, use an anti-seborrheic shampoo. If your dog has infection on its skin, use an anti-microbial shampoo. If you don’t want your puppy to get dirty all the time, make sure you provide a healthy and clean environment for it inside your house. If your pup is struggling while bathing, let it become comfortable with the water. Do not force your pup to take a bath as it will irritate it. For more informative topics on GSDs, you can simply sign-up our newsletter.